WhatsuP! WhatsuP! Fred, Gary and I hit up AP this Sunday. Below is a short clip of some action and Fred getting some air! I think I saw Gary getting some air too but it wasn't in the camera view. I saw Perry sent an alert for wind; anyone make it out to SP for some blasting? Anything good? Last a while? It was gusting to 24mph at AP, waves were knee high. I was on the 112L with a 5.5m. The pro's were on 4.2's and less than 79L sinkers. Bill, you brought a knife to a gun fight. Or more like a spear? :) Can't believe you didn't throw the new board in the car, that things tiny! (relatively) You should take that board out to Bald Point next time it's blowing there. It's waist deep for over half a mile out during low tide. Made me feel relatively safe during the crazy conditions on Friday. Also makes gybe practicing easy, completing them is a different story. Lots of good sailing recently. 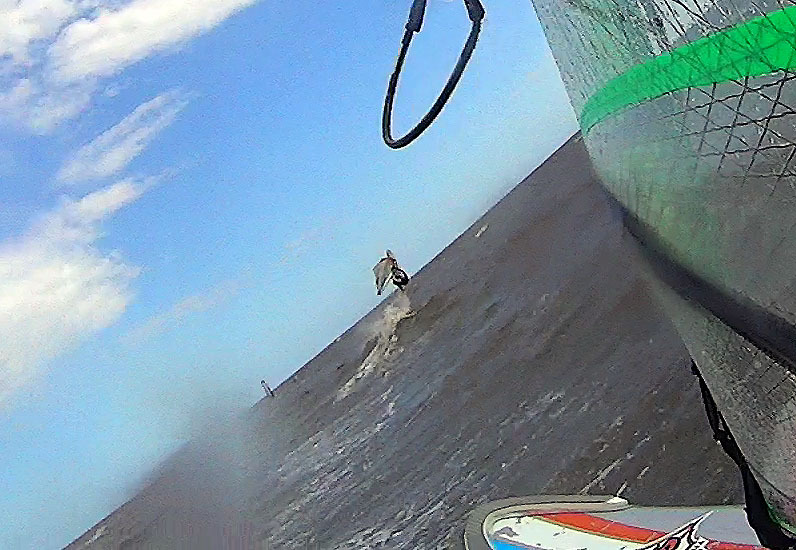 Very good Thurs at SGI in the Park, with waist high to stomach, clean down-the-line sailing, ENE 17-20 mph, 5.3 Goya 84Quad. Big Fri at SGI in the Park was a challenge--on a 4.2/JP 74Quad, but out of control over the shaol big break as it was several feet overhead, breaking solid one wave after the next, avg E 28, gust 34, hanging on. Just blasting off the wave tops you were 8' out of the water, and you didn't really want to be. Too much wind to bear off and jibe, so quick and dirty was the only way to turn. But it did lay down after an hour to barely powered, and the waves stated to lay down too. Then yesterday at AP, classic AP Spring sailing--there were pros out? I missed them. Sorry Alex, the 4.2 is gone. On Sunday Shell Point wasn't bad. After Perry's text the wind dropped a bit, but then came back. Perry, Hugh, and Chris were all powered up. I had brought the longboard and a 7.5 and 9.5, so it was sort of the wrong call. Lots of hook in and hang on. With the low water the flats were very calm, if you could keep from running aground.